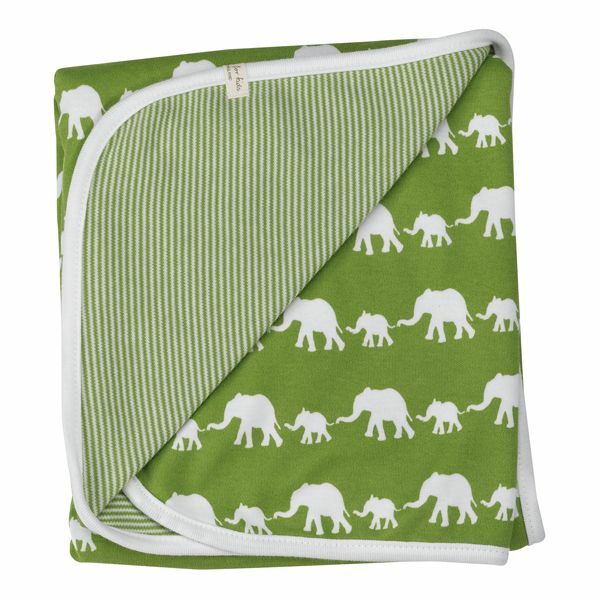 Soft reversible blanket in double thickness jersey. Silhouette green elephant print on one side and stripe on the reverse. The range from Pigeon combines the finest and softest organic cotton with unique but classic designs and a serious attention to detail at every stage of production. Non-organic cotton uses more insecticides than any other crop, with some really horrible social and environmental consequences. With the right support in place, in using organic cotton, the potential benefits for the environment, the farmers and their families can be considerable. This organic cotton comes from Turkey, where there is a very serious knowledge of organic growing and carefully controlled processing.